Green living is not a cult, it’s common sense. This is our favorite quote. Because afterall the pollution which is making living in our cities a dangerous choice is something we all too do contribute too (even if unknowingly). Which is why not only do we bring you products & tips that keep you safe from pollution, we also bring to you products & tips which help you cut your own carbon footprint. Two sides of the same coin! 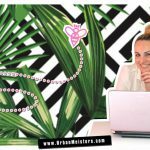 As part of our Green Living Series, founder Mirela gave you tips on how to start reducing waste. In this feature, we introduce you to a very innovative company creating innovative packaging to reduce the packaging waste generated through shopping – online & offline. Say hello to reusable packaging from RePack Original! With fast fashion the norm, everyone is shopping all the time, be it online or in-stores. Add to this shopping for home essentials – from food to other daily requirements. Without getting into official statistic reports on waste, we can assure you that packaging waste figures run into million tonnes – from paper, cardboards, plastics to glass. Online shopping too has been a massive game-changer for both retailers and shoppers worldwide, making virtually everything available for everyone everywhere. We are all at it, and the market is growing at double figures. So retailers reach a global clientele, and we can choose from an endless array of brands and shop at home in our pajamas at any hour (or at the office, looking really focused). This is good news, right? In many ways, it is – but just take a look those heaps of cardboard boxes in backyards and alleys to see the downside: we are drowning in packaging trash. The European Parliament has backed legislation to raise the share of waste to be recycled to 70% by 2030, as originally proposed by the Commission back in 2014. This has led to an interesting philosophy of Circular economy. Companies are currently deeply rooted in a linear approach to growth – make, use, dispose. In contrast, the circular approach means that products no longer have a life cycle with a beginning, middle, and end, and therefore contribute less waste and can actually add value to their ecosystem. This goes beyond recycling. A circular economy is attempting to close the loop by influencing not just end of pipe recycling but also design, logistics and the entire value chain from the beginning. The notion of a circular economy was perhaps most famously articulated by the “cradle to cradle” thinking of William McDonough and Michael Braungart. It is an idea that has risen to the forefront with the work of the Ellen MacArthur Foundation, with the Foundation developing “Project MainStream” in collaboration with the World Economic Forum and McKinsey & Company. Project Mainstream has also started a very cool initiative – New Plastics Economy – a global action plan to transition plastic products towards circular economy. Higher valued uses of recyclables (including for fibre, plastic, batteries, metals, glass, e-waste and energy). It is at Step 2 that RePack Original comes into play – an innovative packaging system aimed at reusing packaging multiple times. How about no more disposable packaging? So you placed your order, and in a few days, your package finally arrives and you get to admire your new spring look. And that’s when, in the blink of an eye, the delivery box goes from being something you eagerly expected to something you need to get rid of. Ok, it’s recyclable – but as an eco-conscious consumer, the question may have crossed your mind: what if it could be not only recycled, but… reused? Well, turns out that someone already has taken packaging that one step further – reusable packaging from RePack! Just drop it in a post box and await your reward! 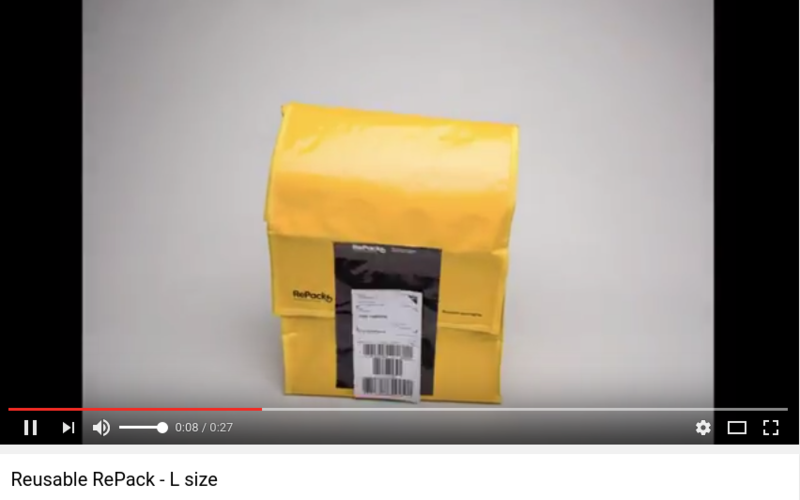 RePack is an ecommerce packaging innovation with the mission to eliminate packaging waste. Here’s how: When shopping at an online store that offers RePack as a packaging option, you can choose to have your purchase shipped in a returnable and reusable RePack. Once you have unpacked your goods, you simply fold the package and drop it in a post box – free of charge, anywhere in the world. 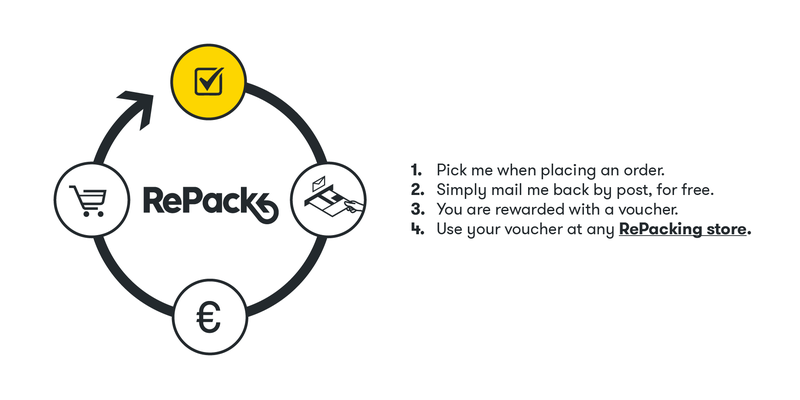 When your RePack has traveled back home, you are rewarded with a discount voucher that you can use at any RePacking web store, and the package will serve and reward many more customers after you: it can be used up to (at least) 20 times. RePack’s business model was invented in collaboration with the web stores that had been involved in the development process. In 2013, it was time to put the RePack concept to the test and see what the customers at one of these web stores, Globe Hope, thought of it. And it turned out that they loved the idea! “They gave RePack an average score of 9.5 out of 10. That’s when we knew we had struck the right chord”, says Hellgren. However, the package – made of cardboard at the time – wasn’t durable enough for reuse. Today, the RePacks are made of the same material as IKEA’s bags: sturdy, yet lightweight and 100% recyclable when it’s worn out once and for all. A RePack returned via mail causes 80% less CO2 emissions than manufacturing a new one. Several packaging designs and service iterations later, RePack is now in use in Finland, Sweden, Denmark, Germany and the Netherlands in over 30 European web stores, growing quickly and currently preparing to expand outside of the EU as well. Unsurprisingly, many of the brands that have joined the RePacking movement are brands that cherish sustainable values themselves, such as Finnish brands Finlayson and Arela, Swedish Filippa K, and Dutch Mud Jeans, to name a few. “Simplicity and sustainability are our core values, and RePack combines two of them beautifully”, says Viivi Arela from arelastudio.com. The RePack team has also been eager to find new innovative and meaningful cooperation models with their customers and partners. Their textile waste takeback campaigns with the textile company Finlayson is a great example, where the idea of circular economy is brought to everyday life through upcycling. During the campaign weeks, customers can send their worn-out bed linen and towels to Finlayson in RePacks posted to them free of charge. They have been rewarded with a generous discount voucher, and Finlayson turns the textile into beautiful rug rags and other upcycled products. Next up is towels made of recycled jeans! The work of the RePack team hasn’t gone unnoticed. Finland’s packaging association awarded them with an innovation prize in 2013, and in 2014 they were the first startup ever to win the Fennia prize, Finland’s most prestigious design prize. This was followed by the Green Alley in Germany, White Bull in Barcelona, EU’s Climate KIC Nordic Winner in 2015 and Werkstatt nomination by Germany’s sustainable development council in 2016 and 2017. The team has grown from three co-founders to 10 people, and RePack and recently entered Finnish innovation fund Tekes’s NIY-program for fast scaling Finnish innovations. 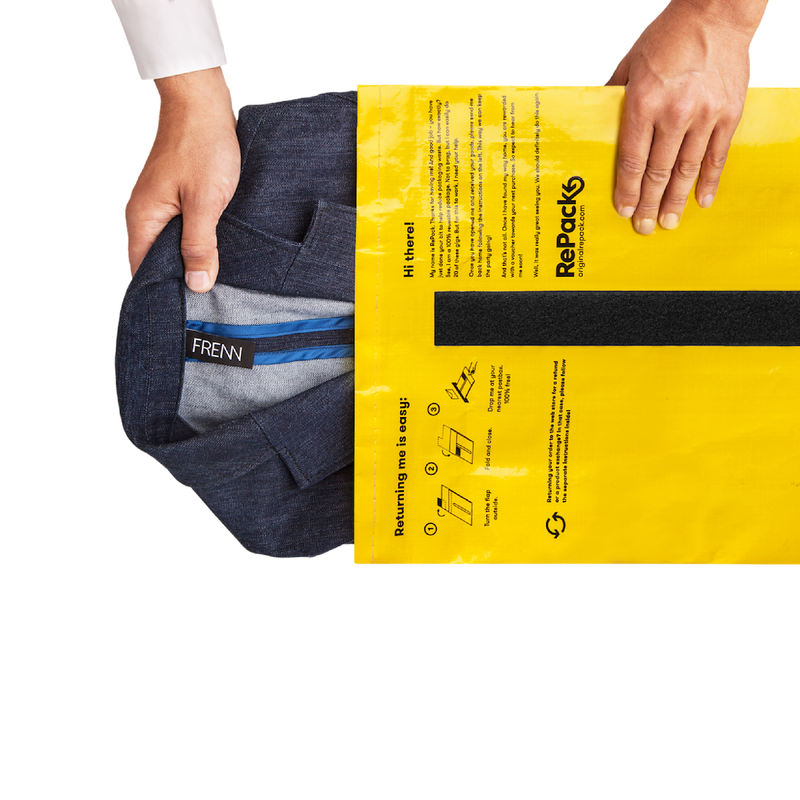 RePack Packaging has been shortlisted for the Nordic Council Environment Prize & has also been chosen for the prestigious sustainable fashion accelerator program by the Kering Group, Plug and Play & Fashion for Good. Are you ready to REPACK? 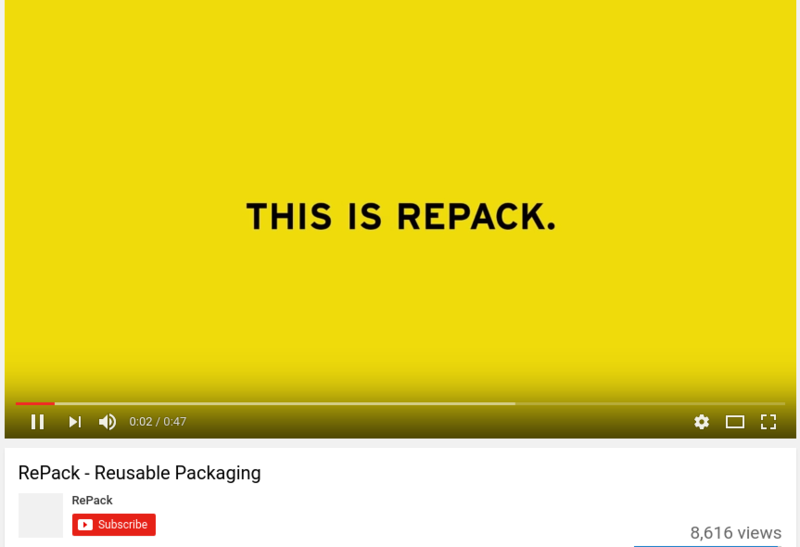 The RePack team is dedicated to outdating disposable packaging for good, and the feedback they get from users proves they are on the right track: sustainable shopping from order to delivery, easy to return, and on top of it all you’re rewarded – what’s not to love? See which brands are already repacking on www.originalrepack.com, and shop away! If your favorite brand isn’t on the list, why not tip them off? And if you work with a company and would like to get in touch with RePack for your packaging, go ahead! 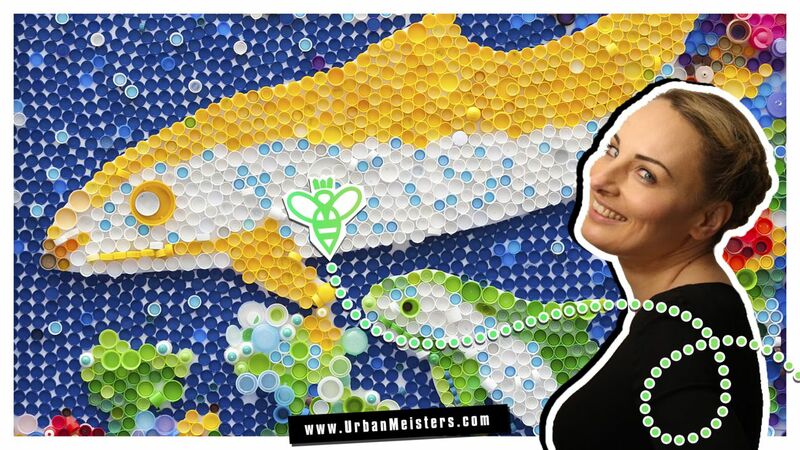 For more tips on how to cut down on plastics and reduce your carbon footprint, follow Mirela’s zero time-taking tips for urbans right here!